Claudia's art to illustrate the recipes! 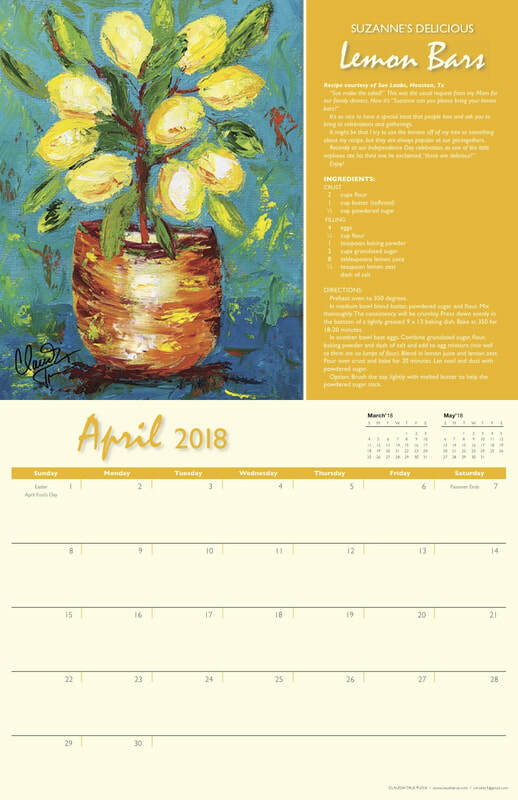 Click here to purchase previous calendars - art and recipes are timeless! Limited to available inventory. Amy Sullivan shared a recipe for Balsamic-Serrano Chicken Appetizers. Amy and I have a mutual friend Connie Mongold who hosts an annual port wine tasting party and that's where Amy first tried this recipe. It's very festive, somewhat easy to prepare and can be made ahead. Port and appetizers - sounds like a perfect celebration to me. Seems appropriate to start the calendar project with a painting for the 2018 Chinese year symbol - especially because my dear friend Cathy Bennet shared a recipe for Shrimp and Pork Dumplings. Two of Cathy's "loves" are dachshunds and all things Chinese. So here ya go - a combination of both! Let's celebrate the Year of the Dog! What does a new Eagle Scout ask for to celebrate this major accomplishment? Well if you're the grandson of Nancy and Sam Potter, it's Sam's Chili Verde! Everything Sam makes is tasty and he's always willing to share with friends, family and especially grandsons. You'll find his recipe and this cute little Eagle Scout pig in March of your 2018 calendar. ​One thing I miss the most about living in California is having my own lemon tree. So when Suzanne Edwards shared her special recipe for Lemon Bars and talked about her lemon tree I was really excited! Suzanne has a cute story about how people love these treats that she takes for all kinds of celebrations. She's not sure if it's the recipe or her fresh lemons that make them so great. I bet it's both! Saloup is a Middle Eastern soup that was once served in a Deli in Shawnee, Kansas. That's where Molly Hunt fell in love with the soup - and she's sharing it's recipe in 2018. It's tasty, simple to make and very versatile. Molly says the chef who made it was Abraham from Bethlehem - so we have a little Bethlehem scene to go with the recipe and story! Nancy Keener says it wasn't summer when she was growing up until she visited her Grandma, climbed her apple tree and got her first taste of Grandmas Ice Box Cake. This happy art was inspired by that recipe and story - you'll see them all in June of 2018. My friend Chuck Kiven has some crazy family celebrations! He shared his cousin's recipe for ribs and a story about how the oven caught fire while cooking them. The volunteer fire department in remote Vermont was called to save the day! He also offers a hint on how to cook them without creating your own fire. Fun story - delicious recipe! The final 2018 recipe painting is for Terry Keuker's German Rice recipe. This is a 4th generation (at least) recipe and is made for every special family gathering. It's sort of like rice pudding, but with a slightly different texture and is often served with the main meal instead of as dessert. Terry remembers having this when his visited his Grandmother's farm on the Missouri River and now he makes it and has passed the recipe to his own daughter. Look for this in September, 2018. This oyster recipe was shared by Paula and Rob Campbell-Taylor - owners of Graveyard Vineyards in Paso Robles, Ca. October is the perfect month for this recipe and art! Paula, Rob and I go back a long way. They recently celebrated Graveyard Vineyard's 10 year anniversary, I was fortunate to host the very first tasting of their wine in my gallery in Bakersfield, and I did the artwork for their original wine label. I'm thrilled they're sharing a recipe this year - so much to celebrate. Sharon Pate, my friend since elementary school, shared this recipe for delicious chocolate pie. I think "warp" refers to how fast it disappears! Sharon has a cute story about how her kids helped to make the crust from the Oreo cookies - you'll have to get a calendar to see what they did. Chocolate, Kahlúa and Oreos - what's not to love? This would be a great addition to Thanksgiving or any holiday - perfect recipe for November! When Ellen Roland shared her recipe for Olive Cheese Balls I was so excited! That's one of the first "fancy" appetizers I learned to make so it brought back great memories. Ellen makes a big batch of these and freezes some for any celebration. Her recipe inspired a recipe for Dirty Martinis which have olive juice. 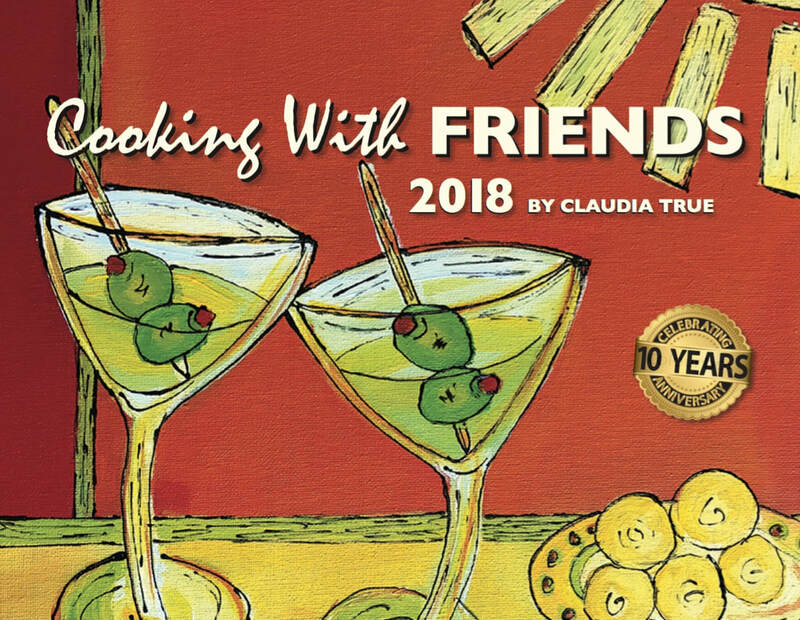 This festive painting of olive balls and olive martinis is now the cover art for 2018 Cooking with Friends calendar. Perfect for December and all those holiday parties. When Richard Goldberg said he was sharing a recipe for Bacon Wrapped Stuffed Jalapeños I was a happy camper! Jalapeños happen to be one of my favorite foods - a bit of South Texas influence for sure. I know that any recipe Richard shares will be super tasty. And I enjoy painting peppers. I wanted to make these sizzle in the painting so I used some bold, crazy color combinations that remind me of Mexico where most of the food sizzles You'll find this in January 2019 for the 2018 Cooking with Friends calendar which is a 13 month layout. So lucky you - you get an extra recipe and art in 2018! Richard, I'll celebrate with you and these peppers anytime!